"Cimatron new NC-Lite product made our shop-floor programming a reality. Tasks that used to require expensive expert programmers' time are now managed by users at the shop floor. Easy to learn and use, and highly automated, CimatronE NC-Lite is perfect for simple and repetitive 3-axis milling tasks." In a world of three-shift shop floors and diverse staff skill levels, delivering consistent and cost-effective 3-axis NC quality is no simple task. The simple and repetitive tasks that comprise much of 3-axis work can require hours of costly expert programming time - leading to bottlenecks, delays and lower profitability. 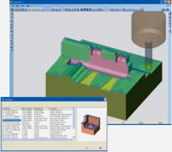 At the same time, relying on novice users for complex programming can result in inefficient machining at the best - and even scrapped parts in some cases. That's why Cimatron created CimatronE NC-Lite. CimatronE NC-Lite combines the power of CimatronE NC with enhanced automation capabilities to deliver true shop floor NC simplicity. Flexible and easy to learn - CimatronE NC-Lite features a unique level of automation that maximizes productivity while minimizing human error. CimatronE NC-Lite ensures that all NC programmers deliver high quality 3-axis toolpaths simply, consistently, and cost-effectively.